THEY ARE DONE!!! After yet another frustrating start to yesterday we finally finished the last coat of paint on the cupboards this afternoon!!! 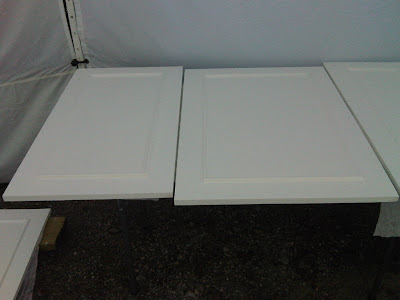 Yesterday I got up out of bed lazily (since I'm on vacation) and eventually made my way outside to paint the first coat of paint on the back of the cabinet doors. I had everything set up and ready to go and I opened up my nice can of supposedly WHITE paint. It looked a little oily and yellow so I thought huh must just need to be stirred.... WELL no amount of stirring could change the paint into white paint... it was yellowy ugly beige. Completely confused because in my mind when you buy a can of paint straight off the shelf it comes only in white I read the front of the can to find that it was NOT white it was called 'Accent Base' which I have discovered is used to tint different colours of paint. ARGH!!! There was plenty of screaming and I believe I kicked something at this point. I was SO frustrated. Especially since I was the only one here and had no car and of course my mom was in town and could have grabbed a can of paint for me while there BUT she NEVER turns her cellphone on. SO I sat down on the ground and waited. And paced and waited. When my mom showed up her initial response was "why didn't you call me..." then she stopped short and remembered her cellphone is never turned on. SO after putting away the groceries we made the trip back into town (its only 20 minutes BUT its still annoying) to pick up a can of WHITE paint. We managed to still get in a coat of paint on the front and one on the back yesterday so it didn't set us back at all. Today we finished the last coat on the front and on the back and it feels great. And more importantly it looks FABULOUS!!! I'm SO impressed with the doors!!! I can't wait to see how they look in the kitchen!! Stay tuned for that on probably Sunday! 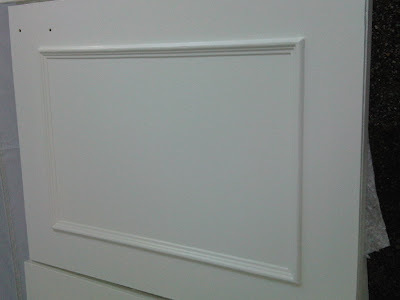 To see other phases of the kitchen reno you can find them here, here and here.